15:30 Visit of Dendera temple. 17:00 Tea at club lounge. 15:30 Visit Luxor & Karnaak Temples. 10:00 Visit the temple of Edfu. 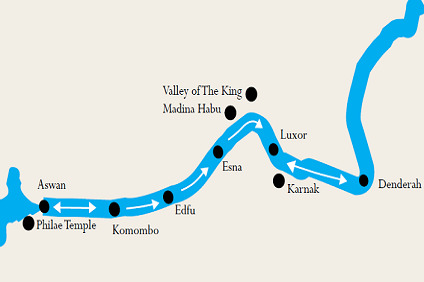 12:00 Sail to Kom Ombo. 9:00 Visit the High Dam and Philae temple. 16:00 Visit Nubian Museum by motor boat.